Is a very productive, NTA-free, alkaline cleaner which reliably removes oil, animal and vegetable fats, insects, road pollution, protein, aged wax and resin encrustations, charred residues, copolymer waxes and microsticks. It is particularly suitable as a pretreatment agent as well as a brush washing agent for automatic commercial vehicle washing, in particular for solving heavy grease and oil contamination on tarpaulins and semi-trailers. nextzett Car Star Universal Cleaner is a highly productive, alkaline cleaner based on nonionic surfactants, which reliably oil, animal and vegetable fats, insects, road dirt, protein, aged wax and Harzverkrustungen and charred residue, copolymer waxes and micro dust removed. The surfactants used are all highly biodegradable (Detergent Ordinance 648/2004) and behave in the waste water environmentally neutral. nextzett Car Star Universal Cleaner is due to its composition suited as a pretreatment agent and a brush washing in automatic commercial vehicle wash, especially for material protection dissolving of strong grease and oil on Planning and trailers. 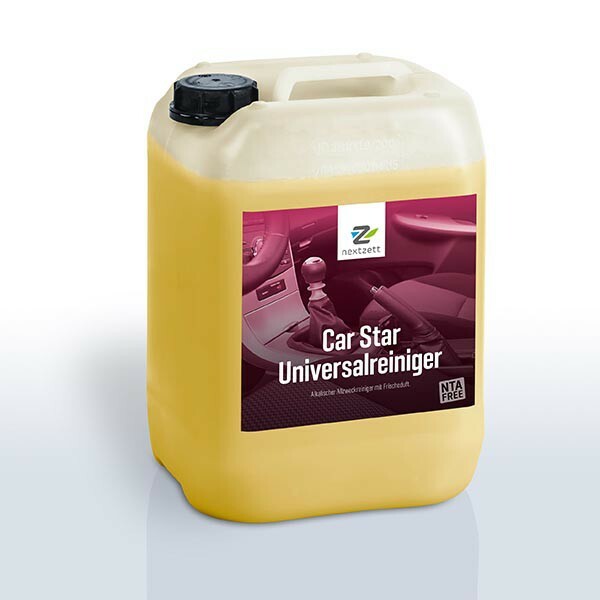 Nextzett Car Star Universal Cleaner also reliably dissolves chitin residues and other heavy soiling. nextzett Car Star Universal Cleaner is suitable for use in self-service Vorsprühgeräten, in all Vorsprühbögen of commercial vehicle washes and for manual application in manual spraying equipment.